When Leon Sullivan arrived in Philadelphia in 1950, he was "flabbergasted" at the conditions surrounding Zion Baptist, where he was to be pastor. Having worked as Reverend Adam Clayton Powell's assistant at Abyssinian Baptist in New York, he recalled, "Harlem was bad enough but North Philadelphia, where I rode that day, beat Harlem in housing decay." In Sullivan's eyes, an influx of migrants, some lured by defense-related jobs, had contributed to a community breakdown. To reach out to local teenagers, he started church athletic teams and drama groups, and began to minister outside the church, explaining, "Some people look for milk and honey in heaven, while I look for ham and eggs on earth, as well as for heaven eventually." His mission included a series of remarkably successful self-help programs targeting Philadelphia's black community, including the Opportunities Industrialization Centers (OIC). An industrial row house neighborhood, Philadelphia, PA, circa 1920. Following a gang shooting of three boys in South Philadelphia in 1953, Sullivan helped form the Philadelphia Citizens" Committee Against Juvenile Delinquency and Its Causes, but soon realized that citizens" committees could only "dust off the slums while the forces that created and maintain them remain and expand." With Reverend Thomas Ritter's help, he organized a youth-employment program, helping to employ about 1,000 people a year. Racial discrimination, however, prevented many from finding jobs and limited the kinds of jobs that were offered. In 1959, Sullivan organized a local picket line in support of Martin Luther King's campaign to open Southern lunch counters to blacks, and soon promoted local boycotts to "break down the Job Discrimination Walls of Jericho." His Selective Patronage program undertook 29 campaigns between 1959 and 1963, targeting the Tasty Baking Company, the Philadelphia Evening Bulletin, Gulf and Sun Oil, and others. Sullivan also led "400 colored preachers" who identified companies with unsatisfactory black employment records. Phoning a selected company, they would outline a demand for black employment including skilled positions, using job turnover rates to determine feasible figures. If the company did not meet the demand after a specified period, typically four to six weeks, the preachers would call for a boycott from their pulpits the following Sunday. Demonstrating the economic power of black consumers, the program directly generated some 2,000 skilled jobs and several thousand more indirectly. Sullivan recognized that in order to fill the skilled jobs now opening to black Philadelphians, many blacks needed job training. Sullivan responded by leasing an abandoned North Philadelphia jailhouse from the city for a one dollar a year. Supported by donations, the job-training center, at 19th and Oxford, acquired equipment from area industries and information from local companies and the Chamber of Commerce on which training programs to offer. To raise the necessary funds for the center, Sullivan took out a loan on his house, received generous donations from the congregation at Zion Baptist, and won a grant of $13,000 from Fidelity Bank and $200,000 of Ford Foundation money granted through the Philadelphia Council on Community Advancement. On January 24, 1964, a crowd of 8,000 attended the opening of the first Opportunities Industrialization Center, which soon offered courses in drafting, machine shop, sheet metal work, power machine operation, chemical laboratory techniques, electronics assembly, teletyping, and restaurant employment. The OIC soon opened additional centers, including one in West Philadelphia at South 52nd Street, dedicated in May 1965, which specialized in "merchandising." Yet another OIC center opened on Gerritt Street in South Philadelphia two months later. Many potential trainees arrived at the OIC with poor basic skills and low self-esteem, often having dropped out of school. To address their needs, the OIC added a "Feeder Program," first established in an old synagogue, which taught incoming students basic literacy, mathematics, grooming, work habits, health, consumer skills, and innovative "minority-group history" classes to bolster self-respect. Here, too, a team of counselor-teachers referred students to a "Technical Skill" center, directly to a job, or to an on-the-job training position. Launched in 1966, the Adult Armchair Education program operated as a "do-it-yourself Feeder Program," holding classes in neighborhood homes and encouraging community improvement projects and links to neighborhood schools. Success soon prompted federal involvement. In 1964, the Labor Department granted $458,000 for the Feeder program (soon increased to $558,000), and the Area Redevelopment Administration awarded another $50,000. The new federal Office of Economic Opportunity contributed $1,700,000 in 1965. The next year the Department of Labor gave $5,000,000 to establish centers in eight additional cities, including Erie and Harrisburg in Pennsylvania. In 1971, the OIC received $32,600,000 to become "a prime national contractor" for manpower services. This gave the national OIC greater control over local centers but threatened its community base. Two years later the Comprehensive Employment and Training Act favored more local control, forcing the OIC to compete with other providers and at times limiting it to partial services in contrast to the comprehensive "whole person" approach associated with the "Philadelphia program." Requirements for training stipends challenged the OIC's conviction that stipends would cause some to view the training as a job and lessen trainees" determination to succeed. Going beyond training, Sullivan also argued that blacks should create their own jobs. In June 1962, he had asked church members to contribute $10 a week for 36 weeks into an investment co-operative, sharing profits between a charitable trust (40 percent), and shareholders (40 percent) and workers (20 percent). The cooperative built a garden apartment complex opened in 1966; the Progress Plaza on Broad Street dedicated in 1968; the Progress Aerospace Enterprises, which earned $2,600,00 in subcontracts from General Electric in 1968; and the Progress Garment Manufacturers supported by the ILGWU. Despite the many self-help programs he created, the OIC remained for Sullivan "the main building block upon which all these other self-help programs must rise." Still active across the country, the OIC currently operates Pennsylvania centers in Philadelphia, Harrisburg, West Chester, Carlisle, Norristown, and McKeesport. 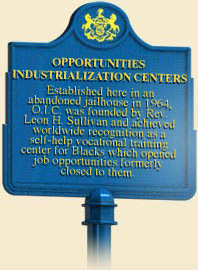 In the 1960s, the successful efforts of the Sullivan, the Philadelphia NAACP, and their allies in the fight against job discrimination in Philadelphia also attracted the attention of U.S. Department of Labor, which in 1967 adopted the "Philadelphia Plan" as a model for its national program to root out discrimination and prejudice in the construction industry. In 1969, President Richard Nixon embraced a revised "Philadelphia Plan," which required federal contractors to hire of African-American employees by specific dates in order to combat institutionalized discrimination by specific skilled building trades unions. The plan was quickly extended to other cities. In doing so, Nixon's became the first administration to implement an "affirmative action" program at the federal level. Leon H. Sullivan, Build Brother Build (Philadelphia: Macrae Smith Co.,), 1969. Leon H. Sullivan, Alternatives to Despair (Valley Forge, PA: Judson Press), 1972. Leon H. Sullivan, Moving Mountains: The Principles and Purposes of Leon Sullivan (Valley Forge, PA: Judson Press), 1998. OIC of America, Inc.	http://www.oicofamerica.org/.